With their first record of the year, Thanks For Coming’s release of the aptly named Back at it Again follows a very busy 2017. With a total of twenty releases on Bandcamp just this past year, most no more than three or four tracks, the Brooklyn-via-Chicago group has been active for the past six years. Thanks For Coming is the project of prolific lo-fi pop artist Rachel Brown. The remaining members of the group’s line up have changed a bit over the years, but Back at it Again features Nate Amos on drums, Charlie Dore-Young on lead guitar, and Mike Kolb on bass (with all three lending their voices to backing vocals on the album). Brown seems to have an endless supply of catchy melodies that they and their band record, produce, and release to their fans as they come. In this record they seem to slightly forgo their normal bedroom pop vibe for a more produced and focused album. 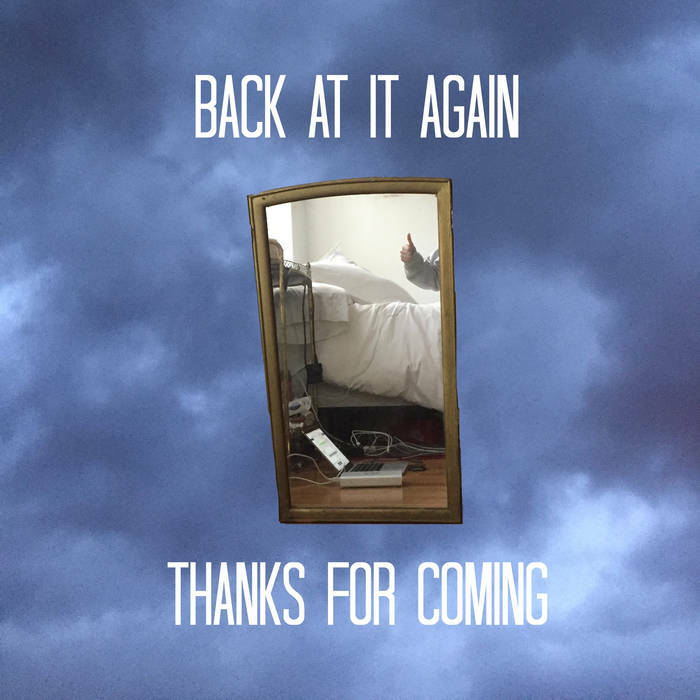 Back at it Again’s tight, indie pop sound is complimented by a full band, which is often missing in the average Thanks For Coming release. What really shines on this album, as often does in Thanks For Coming’s work, are the unique, clever lyrics delivered by Brown’s distinct vocals. The six-track album has an inviting and fun feel to it, while maintaining a sort of intimacy found in its style and message. Whether coming from a place of adolescent frustration or social insecurity, Brown’s lyrics on this record manage to share relatable feelings of everyday worries in a simple, accessible song structure without losing the songs’ senses of fun and charm. The tracks of Back at it Again all share a sort of broken contentedness to them. Brown’s uneasy and anxious lyricism, especially in songs like "Really Losing Touch" and "Eve," share a melancholic sentiment that most who have experienced self-consciousness or insecurity could relate to. Brown’s repetition in lines like “you are an artist and I am a fake,” which they echo twice in “Eve,” and the reiteration of “I think I’m broken when you’re far away/I think I’m broken so please stay” in “I Can’t” express a feeling of dejection in their songs that is complimented by the group’s whining guitars and simple chord progressions. Whether expressing a dissatisfaction with others or with themself, Brown’s lyrics in Thanks For Coming’s Back at it Again guide the narrative of uneasiness and worry in a nevertheless palatable and gratifying package of indie pop hits.